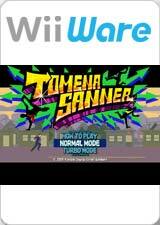 Tomena Sanner: run, jump, and dance your way to victory in this high speed action game. Business man Hitoshi Susumu is behind schedule and is in quite a rush. In fact, he won’t stop once he starts to run! Dashing past samurais, T-Rexes, cowboys, and all manner of wacky obstacles Mr. Susumu must get to the goal as fast as he can for the ultimate 2D dance party. Tomena Sanner is a high speed side-scrolling action game that features a unique timing-based control system that is as challenging as it is fun. As you fly, jump, and dance over the many zany obstacles players need to time their moves to keep their speed up and perform awesome tricks. Using just one button, players of all ages and skill levels will be able to play and help Mr. Susumu get to his goal. Four players can compete to see who is the fastest at running through the bizarre and comical world of Tomena Sanner. The graph below charts the compatibility with Tomena Sanner since Dolphin's 2.0 release, listing revisions only where a compatibility change occurred. This page was last edited on 23 January 2018, at 05:28.